Mega Drive Fan (メガドライブFAN) was a Japanese magazine which focused on the Sega Mega Drive. Initially it issued in bimonthly, And became a monthly from July 1990. 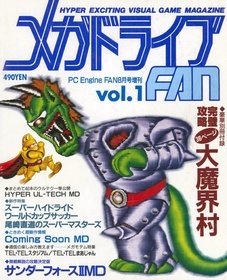 With the September 1994 issue the magazine's name was expanded to Mega Drive Saturn Fan in preparation for the upcoming Sega Saturn release. At the beginning of 1995 "Mega Drive" was dropped from the magazine's name to become solely Saturn Fan.